As with most dieters, I yo-yo with my healthy eating. I’m not trying anything drastic, just a few more healthy options and conscious choices. However, it can sometimes be boring eating salads, as well as thinking about making them nutritionally balanced. This salad is something I created a few months ago when my friend was coming round for dinner. I wanted something healthy, high in protein and fibre, low in carbohydrate but still absolutely delicious. And seeing as it was successful, I made it again this weekend! I use lots of flavours like paprika and garlic to give the salad a kick. It takes a bit longer than a simple salad because of the roasting, however it’s worth it if you have the time. If you’re not bothered about your carbohydrate intake, eat this salad with a delicious crusty loaf of bread. 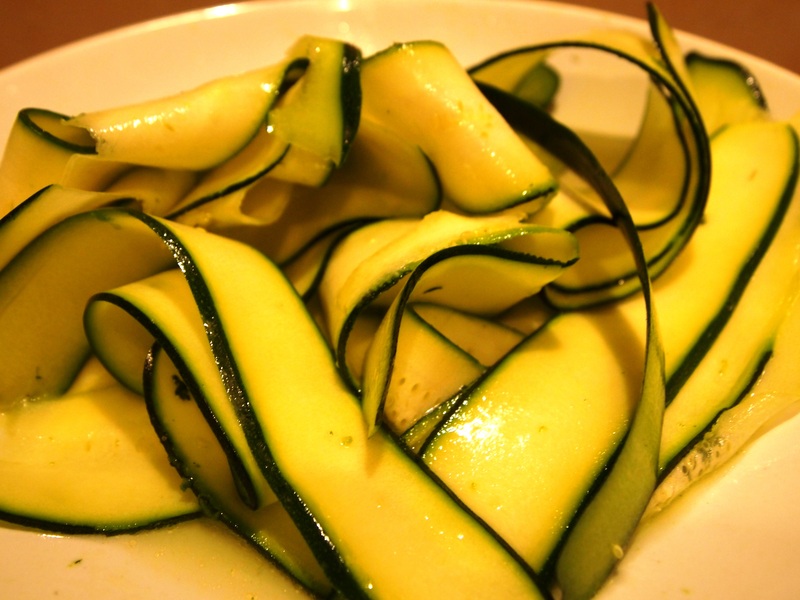 Notes: If you don’t like raw courgette, use cucumber ribbons instead. I love olive oil, but again, you can swap this for your favourite cooking oil. 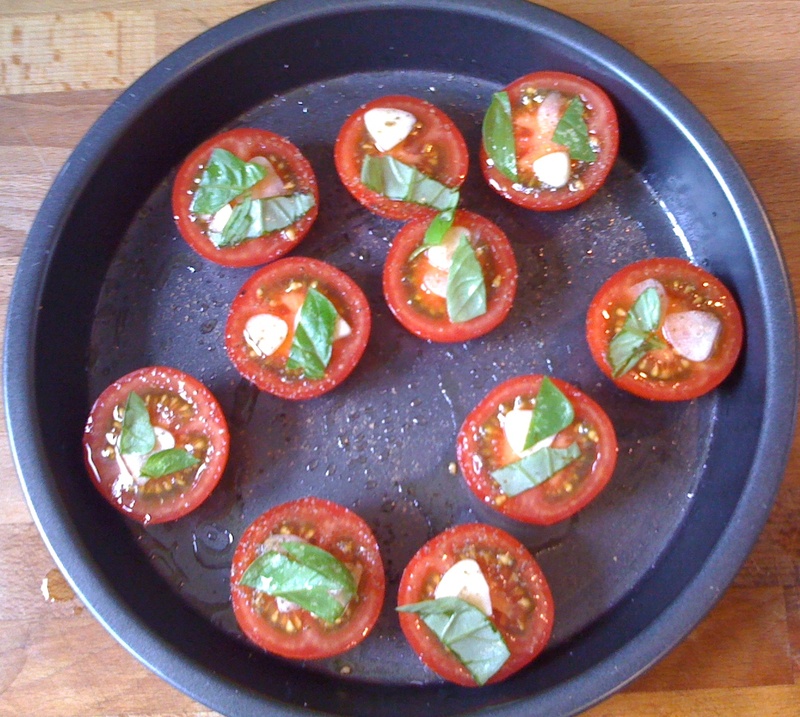 And, if you have fresh herbs in your kitchen or garden, a few leaves of basil work beautifully on the tomatoes. 1. Preheat the oven to 200 degrees. 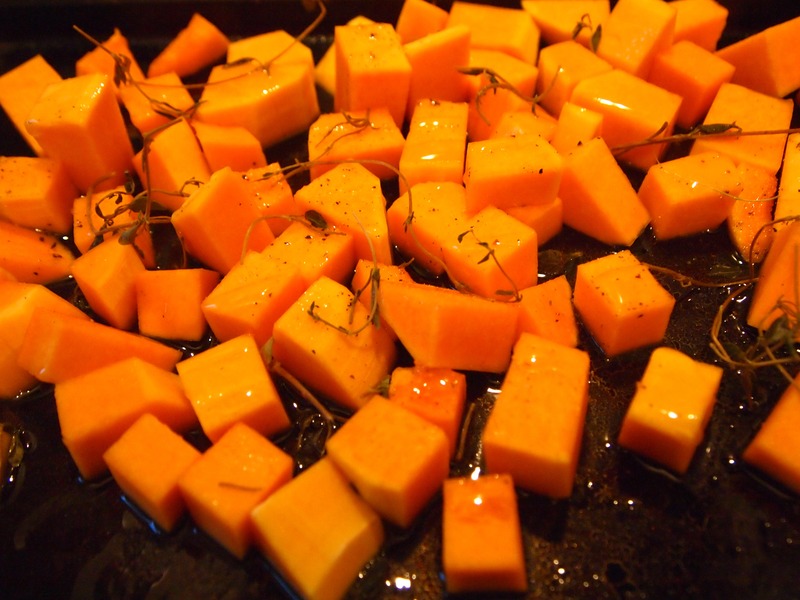 On a tray, toss the butternut squash with 2 tbsp olive oil, the thyme, salt and pepper. Place in the middle of the oven. 2. Place the tomatoes on another tray, drizzle with olive oil, and put a slice of garlic on each half. Sprinkle with salt & pepper and place in the oven. 3. While the tomatoes and butternut squash roast, we prepare the salad and chicken. Make a few slits in the chicken breast to help it take in the flavour. In a bowl or mortar, mix the paprika, crushed garlic, and chicken stock cube with 2 tbsp olive oil. Grind to a paste and then coat the chicken in the paste and leave aside. 4. In a bowl, mix the salad leaves and ribboned courgette (you can simply do this with a potato peeler). Add the dressing and mix it all together. 5. When the squash and tomatoes have been roasting for about 40 minutes and look golden, move them to the bottom of the oven and switch to grill. (Or cook the chicken in a separate grill.) Place the chicken under the grill and cook for about 7 minutes or until it’s turned white and then turn over and cook for another 7 minutes. Then, check the chicken has cooked by slicing it and checking the juice runs clear. 6. 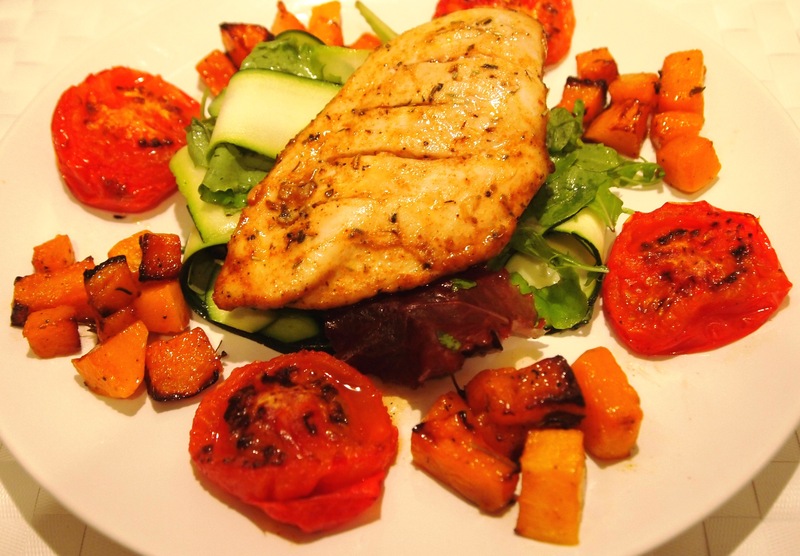 Assemble the salad by placing it in the middle of the plate with the chicken breast on top. Put the tomatoes and roasted squash around the plate. 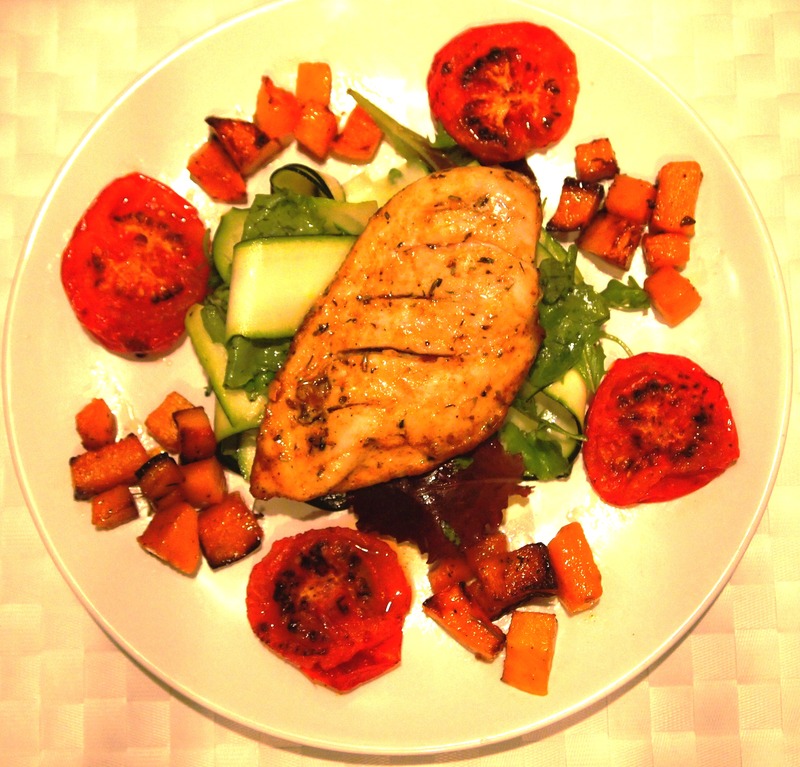 Posted in Recipes and tagged butternut squash, chicken, courgette, food, healthy, low carb, photography, photos, recipe, recipes, salad, tomatoes. Bookmark the permalink. This is a super speedy, cheap and easy recipe. It is also a healthy vegetarian meal, involving two of my favourite vegetables, both from the same family (nightshade). I just love tomatoes and you will always find them in my fridge, as well as tins in the cupboard. When we were kids, my sisters and I shared a children’s cookbook; we used to love making one of the recipes which involved cutting the top off a tomato, scooping out the inside and mixing it with cottage cheese, then putting it back in the tomato. It sounds pretty simple now but it was delicious and exciting when I was younger! I also really like aubergines, but I’m a bit more picky about how they are cooked. Lots of recipes and websites recommend taking off the peel from larger aubergines as it can be bitter, but I actually prefer the peel to the inside. I don’t think I need to tell you how much I love pasta! I could eat it every day! If you’re not a big fan of the aubergine, you could easily do this with sliced peppers or courgette instead. 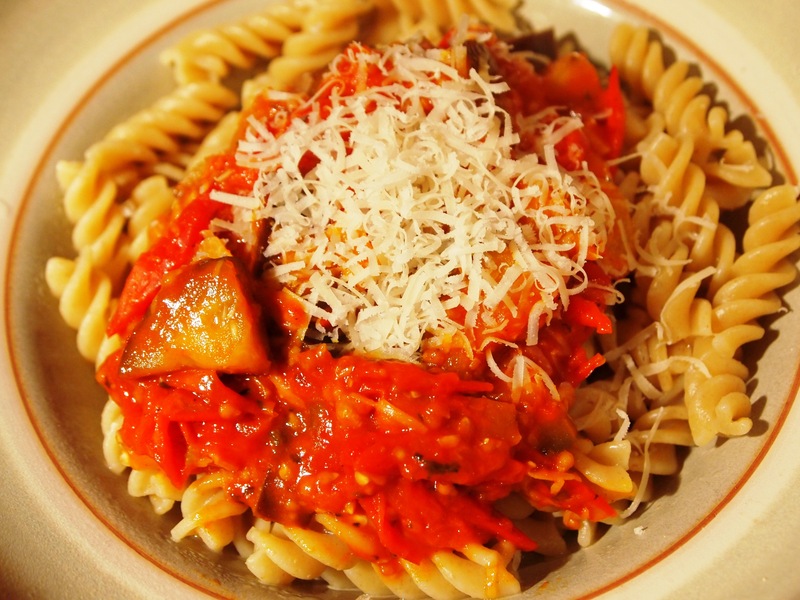 The best thing about this recipe is that you can cook the tasty sauce in pretty much the same time as the pasta boils! Great if you’re in a rush but don’t feel like beans on toast! 1. Boil plenty of water for the pasta. 2. Heat the oil in a separate pan on a medium heat. Add the garlic and fry until it starts to golden, then add the aubergine. Cook for about 3 minutes and then add the cherry tomatoes. 3. By now the water should be boiling, add some salt and then your pasta of choice. Turn down to a simmer and cook for the time stated on the packet, usually about 12 minutes. 4. Use those 12 minutes to add the remaining ingredients to the sauce: the paprika, basil, tomato purée and a pinch of salt and pepper. Cook on a medium heat stirring occasionally. Water will come out of the veg, but if it starts to dry up add a bit of water. Taste the sauce now, and if it is a bit tart, add a pinch of sugar. Serve with grated parmesan or your favourite cheese. 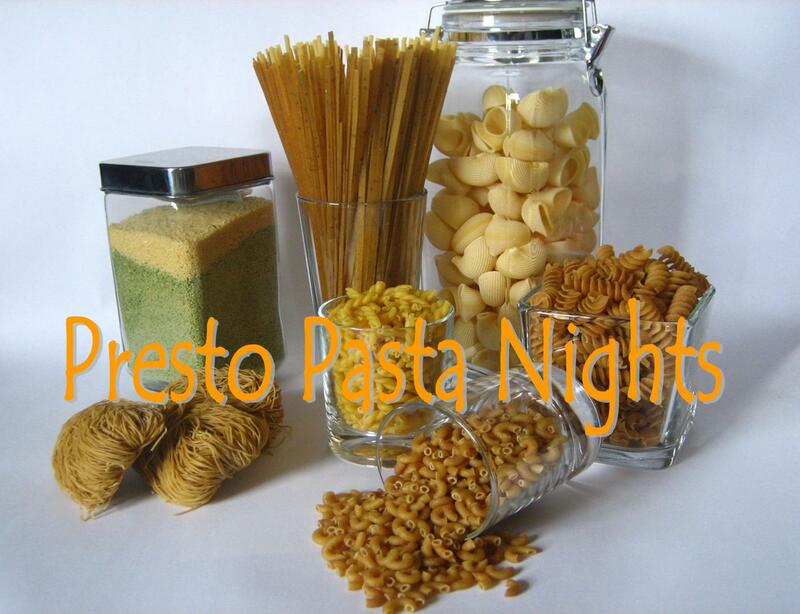 I’m finally getting involved with Presto Pasta Nights, this week hosted by HoneyB at The Life & Loves of Grumpy’s HoneyBunch! Check it out on Friday for the round up of lovely pasta recipes. Posted in Personal, Recipes and tagged aubergine, eat, food, pasta, photography, photos, recipes, sauce, tomatoes, vegetarian. Bookmark the permalink.